I love reading Khabar. Thank you so much for this wonderful magazine. For the past couple of months, much hatred has been shown towards “beef eaters” in India. But across the world, cows are slaughtered once they stop producing milk. This means millions of lacto-vegetarian Hindus across the world are involved in the killing of innocent cows. In general, Hindu vegetarians think that their dairy rich diet is “ahimsa diet”—one that does not involve cruelty to animals—but in the modern world vegetarian food, too, is linked with violence towards animals. This is one reason why many Jains living in Western countries have adopted a vegan diet. Dairy owners in India often adopt unethical measures to enhance milk production, like injecting cows with oxytocin hormone which drastically reduces the lifespan of cows. Some farmers abandon their cows after they stop producing milk. This is why we see many cows eating plastic bags on Indian roads. In short, cows across the world endure a lot of pain and suffering during their lifetime. If Hindus genuinely respect the cow as sacred, then they should stop consuming milk and milk products. Going vegan is a great way to stop the suffering of innocent cows and animals. In the United States, the number of vegans is increasing every year. Actually, it is really easy to thrive on a vegan diet in the United States. Blogs such as Vaishali’s Holy Cow and Vegan Richa are awash with yummy and nutritious vegan recipes. Thanks for pointing out the hypocrisy of the mob in your beef editorial. Your words may be wasted on them because a mob, by definition, is not prone to reason. However, your intended audience is not the mob but the Modi supporters, many of whom are “educated” but may still share the sentiments of the mob at some subconscious level. That said, there are other levels of hypocrisy. The same people who are against narrow, fundamentalist, right wing ideologies here in the U.S.A. have no problem supporting the same in India. One set of ideologues may be Western/Christian and the other Indian/Hindu. What difference does it make if they both share the same xenophobic stripe? Interestingly, the most literate Indian states—such as Tripura, Kerala, and West Bengal—do not ban the sale or consumption of beef. In Kerala, many upper caste Hindus enjoy beef without being stigmatized. Historians and Indologists say that cows and bullocks were offered as sacrifices to the gods and served to guests during weddings and important occasions. With the advent of agriculture came the taboo on killing cows. Professor D. N. Jha, in his book, Holy Cow, says beef eating was a common practice in ancient India, even among Brahmins. Not surprisingly, the book suffered the same fate as beef in India: it was banned. Mr. Jha, a Hindu, is a vegetarian strictly for health reasons. If people want to refrain from eating certain foods to improve their health, or if they think cow slaughter violates ahimsa, or even if they think it is against their religion, I have no beef with that as long as they don’t use it as a form of identity politics and force others to do likewise. Perhaps we need to reexamine our sacred cows and return to a rule of democracy and secularism. Taking a cue from the title of the November editorial, I must say that actually Hitler did fantastic things for Germany, virtually building it up from ashes. But down the road somewhere, either his childhood experiences with the Jews or bad advice made him go astray. Modi is a good guy and I think he will remain so, but even in case he were to go crazy saffron, we have nothing to worry, for India is a democracy and the people will kick him out. In a lighter vein, I think the BJP should use persuasion rather than autocratic laws. They could take a cue from the roadside hoardings of the restaurant chain Chick-fil-A that has two cows painting their plea to meat-eaters: Eat Chicken! I agree with your sentiments about the “Beef Nazis.” Every act of violence is unlawful and shameful. However, it seems these days it’s the fashion to blame everything on Mr. Modi and “Saffron” Hindus. You aptly note that the problem lies with the fanatics, and in the same paragraph you forcibly say that the rest of mankind does not need to live by your standards. Have you ever questioned other religious groups the same way and with the same tone? I don’t think so. Here is why: You will be targeted in multiple ways, and those will include threats to your life. Hindus are a soft target and a punching bag that take criticism well, of all kinds, although now with a suspicious eye. Did you ever write an editorial against M. F. Hussain’s vulgar drawings of Hindu deities? For your magazine, it was freedom of expression. So, when my religious sentiments are hurt, I have no rights? Your prejudice is exposed along with your double standards. No wonder people call you “sickulars” and “presstitutes.” Respect is earned when given to others as well. As for your November cover story (“Where Is Modi Taking India?”), the appropriate question should be “Where Is the Media Taking Us?” The common man is troubled by the economy, not religious fracturing. Focus on the positives India and Mr. Modi have achieved. Your September article, “Interfaith prayer meeting in memory of Dr. A.P.J. Abdul Kalam” by Mahadev Desai, was quite an inspiring read. Dr. A.P. 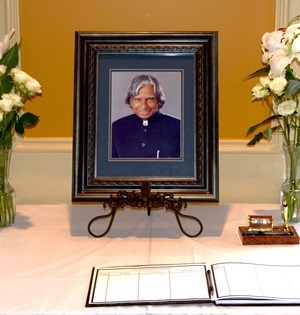 J. Abdul Kalam is the pride and joy of India; his life story is an inspiration to the young and old. I am sharing here a heartwarming vignette about this great son of India. Dr. Kalam spent the larger part of his career at the Thumba space station at Trivandrum. His favorite eating place was the Guruvayurappa Restaurant close to the Secretariat in Trivandrum, run by a Hindu couple. He was a light eater, preferring simple meals of rice, wheat bread, and vegetarian dishes. When Dr. Kalam became the President, the couple wrote a letter expressing their desire to meet him in person. A few weeks later, to their surprise and delight, the Trivandrum District collector contacted them, informing them that Dr. Abdul Kalam would be visiting Cochin shortly. They were to be State guests and would be taken to meet the President at Cochin. When the nervous couple faced Dr. Abdul Kalam with folded hands, the smiling President said, “Now Guruvayurappa Restaurant is in Cochin, too.” They spent more than an hour together and subsequently met the President on several other occasions. The family was heartbroken upon his death. Indeed, Dr. Abdul Kalam was an embodiment of humility. To the three inspiring Indian personalities in my life—Mother Teresa, Mahatma Gandhi, and Swami Vivekananda—I have added one more person: Dr. A.P.J. Abdul Kalam. I think there is a correlation between the Indian diet and conditions like diabetes and heart disease. With income levels rising in India, food consumption has increased but so have sedentary lifestyles. The emphasis on carbohydrates in the Indian diet could be either because of past famines or because it once offered people greater energy that was required for physically demanding work. These likely reasons for the evolution of a carb-rich diet no longer exist and physically strenuous occupations have also diminished. The dietary pattern, however, has not changed. While it’s true that the fast food joints coming to India sell unhealthy food, one cannot take a one-dimensional view of the problem and blame foreign food companies as the source of India’s dietary ills (which is how many Indian nutritionists pontificate). Think about the range of Indian foods like dosa, idli, samosas, vada pav, khichdi, rotis, naan, daal, etc., that are loaded with carbohydrates! The Indian diet must change to involve less carbohydrates as levels of affluence and sedentary living rise.